This page contains a character guide for Captain Cold in Injustice 2. Here you’ll find movelists, combos, juggles, strategy guides and recommended gear for the villain character. For more Injustice 2 content, head over to our Injustice 2 top page. Stealing a technologically-advanced cold gun and donning a signature blue and white parka, Leonard Snart became Captain Cold, one of the Flash’s most dangerous enemies. Whether on his own or leading a gang of Central City villains known as the Rogues, Cold approaches the job at hand with an utter lack of emotion. His only concern is getting it done as efficiently as possible. Captain Cold possesses a cold gun, which generates a cold field at absolute zero temperatures, completely draining molecules of their kinetic energy, preventing them from generating motion. The Cold Gun can also fire streams of ice as beams, creating ice wherever they strike. Cold is a skilled tactician and has led the Rogues for many years. Meter Burn R2 (must press R2 at the beginning of Cold Blast). The opponent will take damage over time while standing in frozen area. There are 3 levels to Cyclotron Charge. Holding ○ will charge the Cold Gun allowing different special moves to be performed. Frosted Tips requires 1 bar of Cyclotron Charge. Captain Cold coats himself with icy spikes that will damage the opponent when connecting normal and special moves. Glacier Grenade requires 2 bars of Cyclotron Charge. The opponent will take damage over time and begin to freeze while standing in frozen area created by the Glacier Grenade. Cryogenic Blast requires all 3 bars of Cyclotron Charge. Below are combo and juggle inputs for Captain Cold , including corner strategies and restarts. 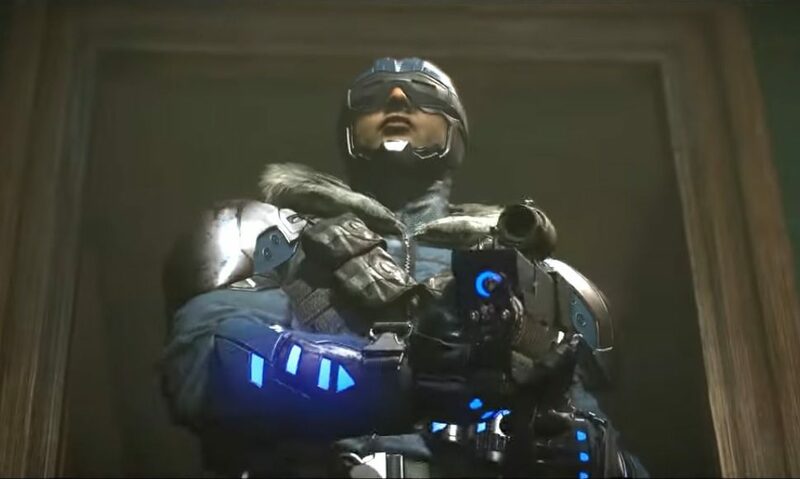 Captain Cold wears a blue body suit of plated armor along with a parka hood and a pair of custom pink tinted goggles and a set of holsters around his waist for his Cold Guns.